If you have been reading for any of these 11 years, you know that I try to link to scientific studies and peer-reviewed articles to substantiate any worries about ingredients. I used to fall for fear mongering. We've talked about this before. I once took the Cosmetics Database as the gospel. As a new mom and as someone who'd just lost a loved one to cancer, I wanted to do ANYTHING and EVERYTHING to protect my family from being more likely to develop cancer down the road. And then I took my blinders off and came down to earth and and remembered that EVIDENCE and FACTS are stronger than fear and hysteria. Before I express a concern over an ingredient or product, you will see that I link to sources or mention studies. I am not talking about quoting Mercola, David "Avocado" Wolfe, Food Babe or Natural News -- but actual, factual science in terms of peer-reviewed articles and studies. Just because your cousin's friend's neighbor's stepmother read on Facebook that something is "toxic" does not make it true. 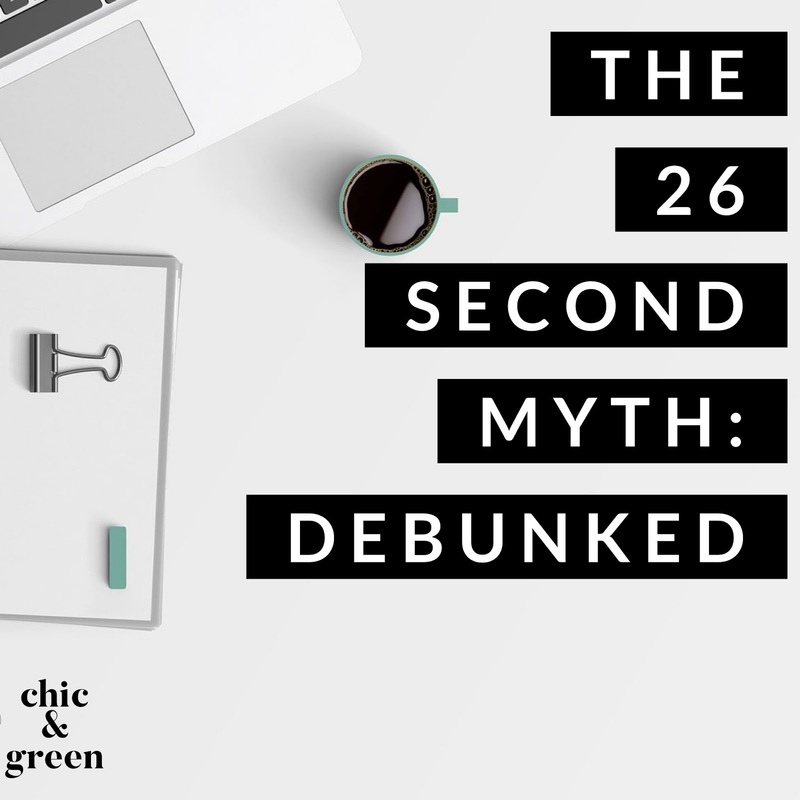 Today I am starting a weekly series on some of the claims floating around social media (especially by MLMs) and the blogosphere that we should examine. Today is the first of many of these in-depth looks at scary claims. 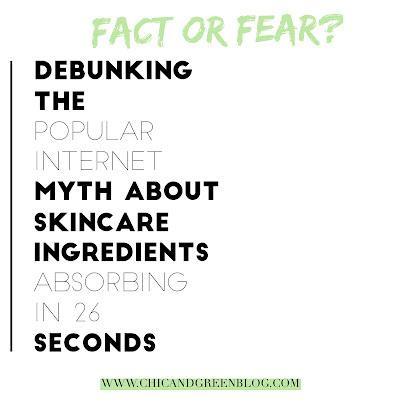 Claim: "It only takes 26 seconds for the ingredients in your skincare products to be absorbed into your bloodstream." You've seen this claim floating around Facebook and on blogs in colorful memes. It sure sounds scary, doesn't it? Do not worry, friends, as this is just a MYTH. When it comes to penetration, the 26 seconds claim is not how things work. In fact, there is no scientific data to back this claim, which seems to have originated on an organic health and beauty blog a few years back. The claim has spread like wildfire, but just because you read it on the internet does not make it true. By the way, the "Your body absorbs 60% of what you apply to your skin" is NOT backed by any peer-reviewed studies or other forms of credible science either. Our skin is made up of three layers. The epidermis is the outer layer that we see and feel each day. The dermis is the layer of living tissue found underneath the epidermis. It has hair follicles, nerve endings, sweat glands, etc. The hypodermis is also known as the subcutaneous fat layer. This is where fat is stored, body temp is controlled, and this is where the upper layers of your skin are attached to muscle and bone. Part of the trouble out there is that the words penetration and absorption tend to be used interchangeably. The problem is, these are NOT the same thing. Let's break it down. Start with a topically applied skincare product. Let's say a body lotion for the sake of this post. You rub that lotion into your skin and what happens? Skin penetration signifies the amount of the topically applied chemical (remember, everything is a chemical) that is between the top and bottom layers of the epidermis. At this stage, the chemical is not absorbed into the body. On the other hand, skin absorption is when the ingredients get through the skin barrier and into the bloodstream. At this time, it is either filtered out when you go to the bathroom or is let to accumulate. Some ingredients can penetrate deeply into these layers. Some don't actually penetrate the skin at all. An example of this would be nanoparticles, which are often vilified. There are many factors that have an impact on whether or not something will penetrate the skin. These include whether an ingredient is water or oil soluble and its molecular size and weight to name just a couple. Most ingredients do NOT actually absorb. They have molecules that are just too large or are only water soluble. They sit on the outer layer and cannot get any deeper into the skin. When it comes to ingredients like retinol, ingredients called penetration enhancers are used so the active ingredients will be able to deeply penetrate the skin. Let's talk about what happens when a skincare ingredient only penetrates the upper layers of your skin. In this case, it does not get absorbed into your bloodstream. These ingredients ultimately accumulate and are naturally sloughed off in the form of dead skin cells. Even when an ingredient does manage to penetrate deeply and get absorbed into your bloodstream, your body will almost always flush it out thanks to the natural "detox" function of your kidneys. Yes, we should be mindful to choose products with wholesome ingredients. However, there is so much misinformation out there. Science matters. Much of what you read on the internet condemning ingredients is written by people with ZERO background in formulation, chemistry, skincare, health, etc. Be wary -- do your own research -- and look for science. Research the websites from which you are gathering your info. C.L. Gummer,R.S. Hinz,H.I. Maibach; The skin penetration cell: a design update, International Journal of Pharmaceutics. International Journal of Pharmaceutics 06/2014; 472(1-2). Who makes the best vanilla body wash?